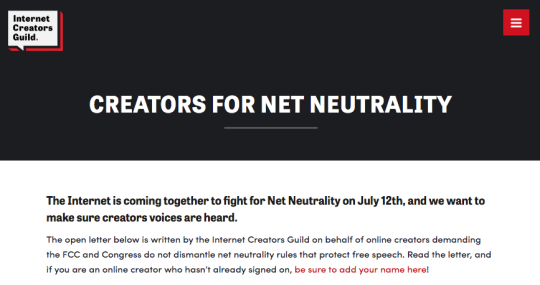 July 6, 2017 – A group of 130 prominent online video creators from across the country have expressed serious concerns with the Federal Communications Commission’s (FCC) plans to roll back net neutrality protections for Internet users across the country. In an open letter released today, creators warn that if the FCC slashes Title II – the strong legal foundation for U.S. net neutrality protections – the impacts of allowing Internet service providers to block, throttle, and charge fees would be immense for online video creators, many of whose audiences rival traditional media in size. The letter, organized by the Internet Creators Guild, highlights the skyrocketing popularity in video traffic over the past decade, and warns that any weakening of the FCC’s 2015 Open Internet Order “…would have an outsized impact on our field and jeopardize our livelihood.” The letter’s signatories, who collectively reach over 165 million people in their audiences, worry that a loss of net neutrality will give Internet service providers (ISPs) new influence over how online creators are able to grow their businesses. They argue that these protections are crucial to maintaining a level playing field. The organizers are encouraging more people to sign on, as names are being added on rolling basis. 7. Mindy McKnight of CuteGirlHairstyles (5 million subscribers). The letter also highlights support for net neutrality policies from an overwhelming majority of Americans, and comes just days in advance of a July 12th Internet-Wide Day of Action to Save Net Neutrality. Over 50,000 people and thousands of websites have already joined the online protest, including web giants such as Amazon, Reddit, Netflix, OkCupid, Mozilla, Etsy, Kickstarter, Vimeo, and many others. This action is part of the Internet Creators Guild’s efforts to advocate for and support creators. The non-profit organization was created in order to bring internet creators together to make their profession more sustainable.